Survivalists, homestead and commercial farmers, pet owners and people interested in natural healing all tout eggshells as a source of calcium in the diet. Extracting the calcium takes time, but costs far less than supplements or fertilizers, an attractive economic option. Using eggshells as a calcium source for direct consumption, through extraction or through indirect consumption, by feeding them to animals or using them as fertilizer instead of relegating them to the trash, preserves the environment. Using eggshells as a source of dietary calcium may lead to food poisoning due to salmonella or other bacterial contamination. Calcium content may vary from eggshell to eggshell and from batch to batch, depending on the method used to extract it. Vicky Ferguson, nutrition columnist for "The Grand Rapids Press," prefers calcium sources that are United States Pharmacopeia-approved, meaning that the amount of the nutrient as stated on the label is the amount of the nutrient in the pill. Bringing the eggshells to at least 140 degrees Fahrenheit as measured with a food thermometer for at least 3 1/2 minutes, a process known as pasteurization, kills most bacteria, according to the American Egg Board. A rolling boil, at 212 degrees, falls well above the 160 degrees recommended by the USDA Food Inspection and Safety Service for safe egg consumption. 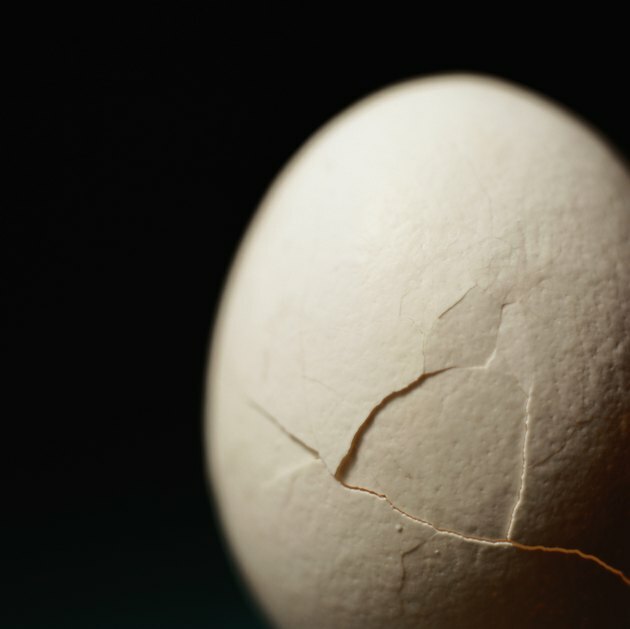 Eggshell powder reduced pain from osteoarthritis, increased mobility and stopped loss of bone density in post-menopausal women who participated in a study published in 2003 in the International Journal of Clinical Pharmacology Research, lead by J. Rovensky of the National Institute of Rheumatic Diseases. Calcium and sunlight prevent metabolic bone disease in turtles, also known as "soft-shell syndrome," states Anchorage, Alaska teacher, Mary Hopson. Her website, "The Turtle Puddle," has provided information about turtle health since 1999. Boiled, crushed eggshells provide turtles with a natural source of calcium, according to Hopson. Eggshell powder also helps chickens and other birds produce eggs with thicker shells. Once you boil the eggshells long enough to kill any bacteria, air-dry them in sunlight, covered with cheesecloth to keep pests off them, or oven-dry them at 140 degrees Fahrenheit in a single layer on a cookie sheet for an hour. Use a coffee grinder for best results when making eggshell powder for human consumption, as the resulting particles are finer in texture and easier to mix into liquids. Make grit for chickens and other birds in a blender. Turtles and other reptiles prefer larger pieces of eggshell rather than grit or powder, although the powder mixes easily into their water source. Although it does not address the use of eggshells for calcium, the USDA Food Safety and Inspection Service recommends using anything containing eggs or egg products within three to four days of initial preparation. Store eggshell powder in a sealed container in the refrigerator between 40 degrees Fahrenheit and zero degrees. Can Pregnant Women Drink Ultra-Pasteurized Milk?